A take on Chinese fried rice to finish off our giant Napa cabbage. This turned out superb. 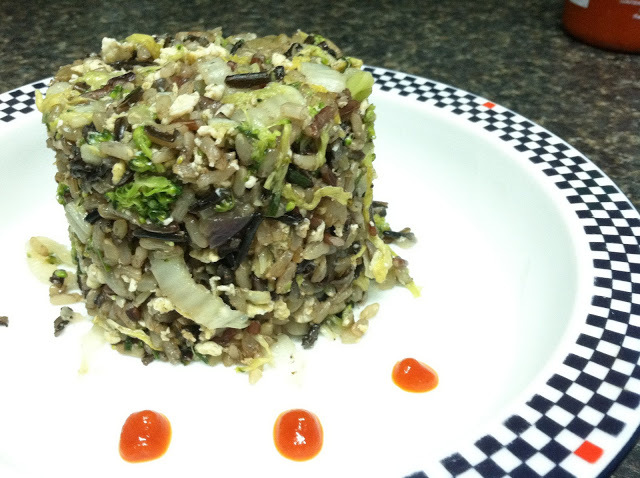 The wild rice throws in a healthy flavorful kick. Bring the water to a boil and add rice. Simmer until the rice fully absorbs the water - do not burn. Meanwhile, in a cast iron skillet, large pan or wok, sauté the onions, garlic and ginger until the onions are translucent. Add the broccoli and sauté until tender. Add cabbage and condiments and continue to sauté. Add the rice and mix together. Add more sauces to taste. Push the rice and veggies to one side of the pan and crack the eggs on the other side. Let them set and then scramble. Once scrambled, mix into the rest of the dish for another 5 minutes until eggs are fully cooked. Let sit on the pan to crisp / lightly fry. Eat!